Alexander Payne follows up his sombre tale of a single life, Nebraska, with a similarly downbeat examination of every single person on Earth. 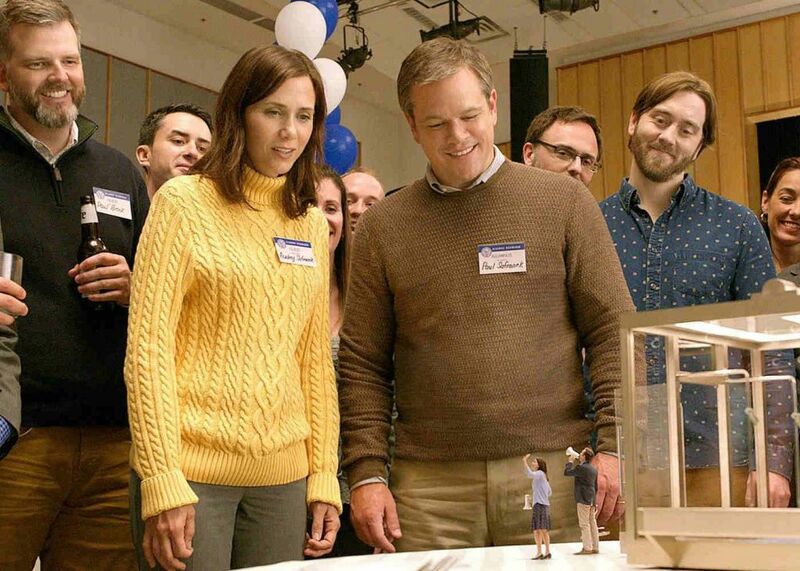 Downsizing is something of a surprise; an ecological call to arms, and critique of contemporary America, as well as the wider world, all disguised as a playful 1950s Science-Fiction throwback. There’s romance, comedy, pathos, a star making turn from Hong Chau, and more smart ideas in a large studio movie than you’d normally find in a year’s worth combined. However, much like Damon’s disillusioned everyman, you might not exactly get what you thought you’d signed up for. Paul Safranek’s (Matt Damon) discontent is because he lives in the same house he grew up in, has progressed through the same meat packing company to become an occupational therapist, abandoning his dreams to become a doctor, and cannot afford the kind of house his loving wife (Kristen Wiig) wants to look around. He’s a happy guy, he just doesn’t know what his place in the world is. As it turns out, it might have been under his nose all along. Literally. You see, Payne’s film is set in a future now, in which groundbreaking experiments mean that humans can be irreversibly shrunk down to a height of five inches, reducing their waste footprint to a single garbage bag over the course of five years. Other benefits include a huge growth in wealth; $1 in the real world equates to one thousand times that amount in the Truman Show esque Leisureland, where Paul and Audrey decide to make their little life. What they learn however, is that you might be able to alter the anatomical make up of a human being and the size world in which they live, but changing human nature is a very different issue altogether. Downsizing unfolds as exactly the kind of film you’d expect is to be from the terrific premise. The way in which the high concept is presented, grounded in reality, with educational nuggets about the philanthropy of the founder of the mustard gas arching the eyebrow, whilst the reveal of a tiny man hosting a seminar will raise the corners of the mouth. The opening is a giggle-worthy delight, as Damon and Wiig are slowly convinced to take the plunge, by a combination of numerous cameoing actors (Laura Dern in the bath), and the promise that their personal wealth would be in the millions. The writers (Payne and Jim Taylor) take real delight in poking fun at those who don’t believe in the impact of humanity upon the world, so we get a few flat earthers offer up “the world isn’t going to end tomorrow” selfishness. The balance between the hilarious novelty of watching Damon transform into his Elysium character, or seeing tiny people being scooped up off gurneys, is juxtaposed by the kind of social commentary that will ensure this will never get screened in The White House. The problem is, it can’t maintain the balance, and Downsizing becomes a bit tonally askew, with so much going on. It veers from the chaos of introducing the brilliant Christoph Waltz, relishing the chance to play a nice guy, and party going neighbour, before moving onto the real heart of the movie, the brilliant Hong Chau. Playing a victim of the science, rather than a willing participant, she is the only person who sees the micro word for what it is, and Chau brings a real eye widening wonder to her role. Her prominence in the weaker second half of the movie prevents it turning from Downsizing into capsizing. Chau is also integral in making sure that Damon evolves from bystander at the middle of a cute concept, into a character worth investing in, especially when he makes some questionable decisions towards the end. Whilst Downsizing is about the little things, it’s also about too many things, some of which you might not have expected from the playful concept. Its intentions are honourable, tackling the heath care system, class, wealth, racial disparity, but it doesn’t really know what to do with them. Maybe it should have aimed a little smaller?